Hello Friends! 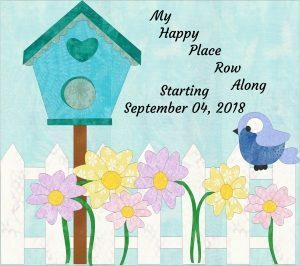 I am so glad you came to visit my stop on the My Happy Place Row-Along and blog hop. It has been a fun tour of fabulous blogs. I love meeting new friends who share my love of quilting. Marian of Seams to Be Sew did a great job getting everything set up – be sure to visit her blog and register for some amazing prizes! The theme for this year is My Happy Place. For a quilter, happiness naturally comes from our craft so my first thought was to use my favorite blocks to make a row, but I’ve already done that in my Favorite Stars table runner. 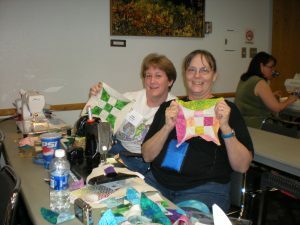 As the designers were sharing ideas, I saw several quilters with the same idea. I decided to take my row in a different direction, but I will definitely add their quilt-themed rows to my final project. I thought more about exactly how quilting brings me happiness. Yes, there is joy in the making of things that are beautiful and useful, but I get the most satisfaction from sharing my work. The idea of sharing steered me to the recognition of community that we find in our quilting world. Friends definitely bring me happiness, no matter what location we are in. Paper-piecing a simple paper-doll style block represents our many quilting friends. I added an applique title block and surrounded the row with friendship star blocks. When I was auditioning layouts, I discovered this row can be assembled either horizontally or vertically. It is good to have options! You can purchase the pattern here. 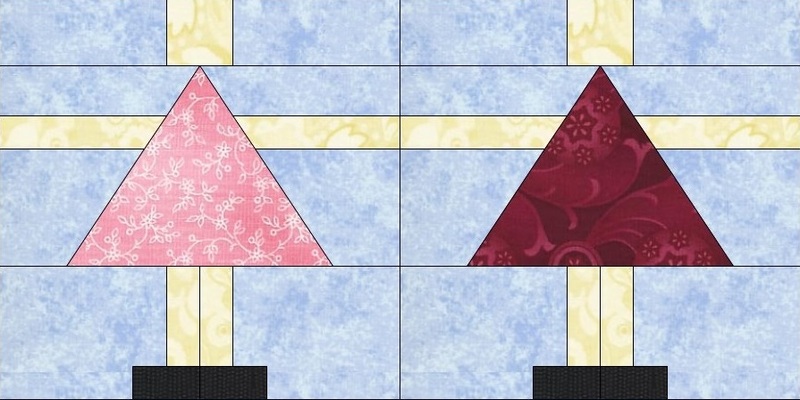 It includes templates and instructions for the complete row, featuring paper piecing, applique and the friendship star blocks. 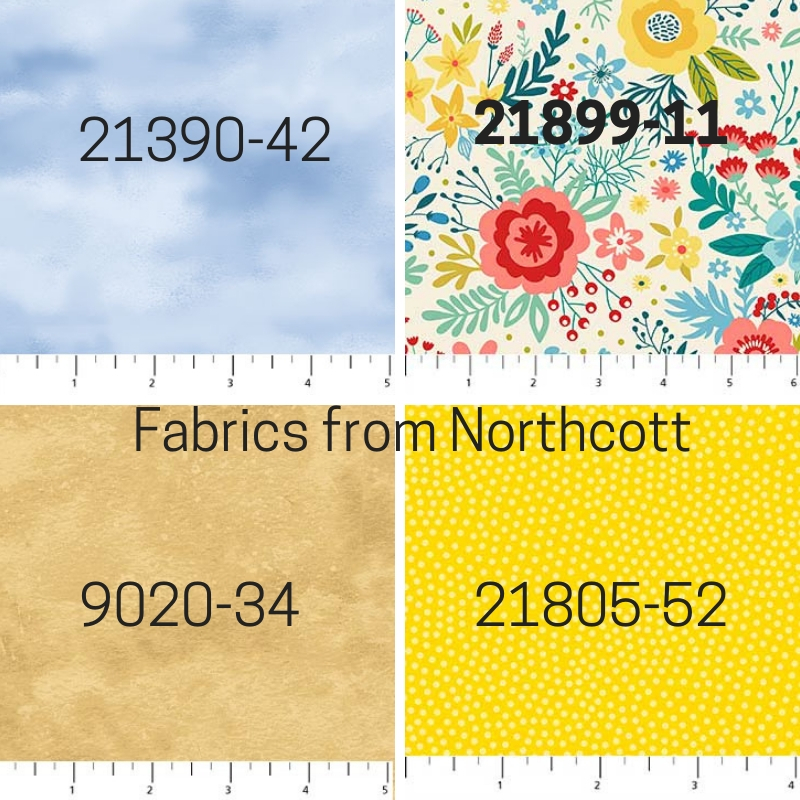 Northcott was so generous to all of us designers! We got to choose 4 different fabrics. Please join me in thanking them for their support of the Row Along, and go buy some new fabric – you deserve it! Our superb hostess, Marian of Seams to Be Sew, has so many great prizes for those of you that take the time to participate in the blog hop this year. 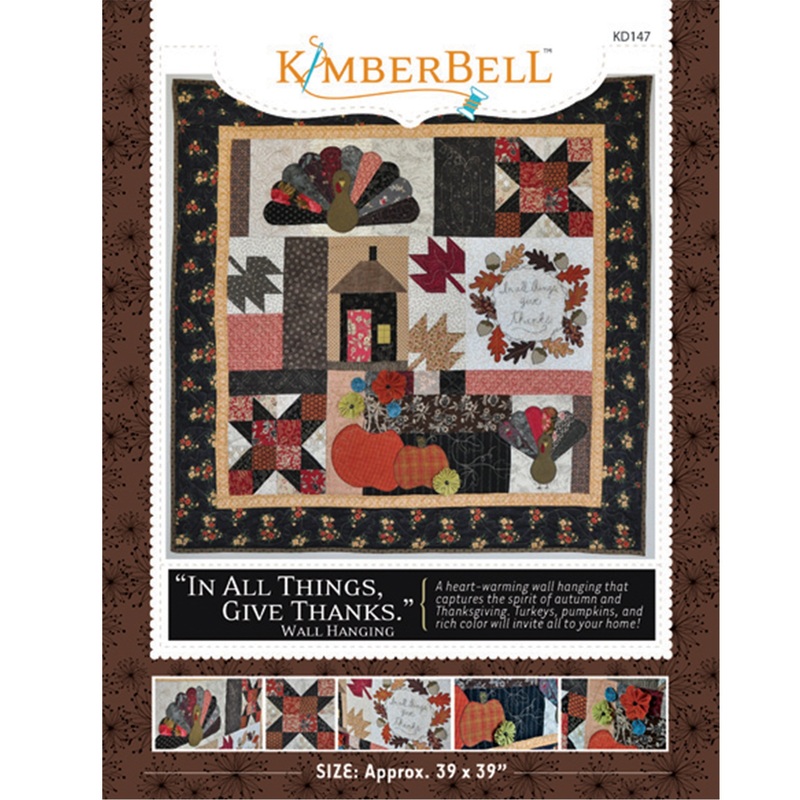 I am happy to offer TWO copies of the Kimberbell wall hanging, In All Things, Give Thanks. Enter to win from Oct 2nd – Oct 9th, 2018. Congratulations to Cecilia and Thunder. Please look for the email from Marian/Seams To Be Sew for details on collecting your pattern. Did you like the Row Along? I had a blast designing a row and visiting all the blogs during the past six weeks. Marian says this is an annual event, and I look forward to participating again next year. 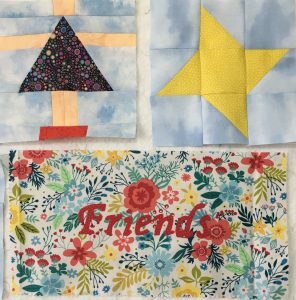 There is definitely joy in friends we make in the quilting world, so this row is a perfect way to depict a happy place…love it! Thanks for sharing! So why am I being charged for Shipping? Rookie mistake, so sorry! The shipping option has been changed and you should not be charged. The Friendship Star is one of my favs. Thank you for the sharing the pattern. I love your block! Stars are a favorite of mine. I have been downloading the “My Happy Place” Rowalong patterns as they have been coming out. So far they have been free and downloadable. 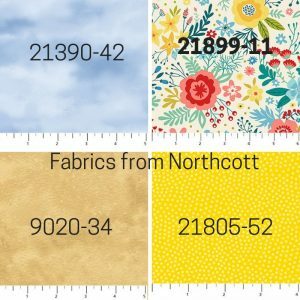 I saw on your site that there is a $5.00 shipping charge – is that because I can’t download your pattern? At this point, I have not ordered it. I made a mistake when I created the pattern page, and didn’t change it to free shipping. That has been fixed. Thanks for visiting! I like how it turned out . The yellow is wonderful. Love your row! Friends are the best! Hi there, I like your row friends are the best. I do have a concern in that I do not want to pay $5 for shipping for the free row. Did i miss something when I read your post and the instructions to order. If I am a winner I am willing to pay for any shipping costs. If I read this wrong I am truely sorry. Your designs are great. I apologize for any confusion. My shop has been updated so it no longer charges shipping for a free download. I updated the shop settings, it should no longer charge shipping for a free download. Thanks so much for being a part of the Row-Along. I thought I’d already posted a comment, but after checking a couple of other sites then coming back, I didn’t see it anywhere. I see to be having problems with YouTube, Facebook and a couple of the blogs not working. With yours I’m unable to download the pattern because it’s showing that I have to pay postage to get it. – $5.00!! I’ll keep checking and trying till it works! 🙂 Thanks again! Love your block! I am so glad you shared this row design. I also love to quilt with friends and I plan to make the vertical version for a wall hanging for my sewing room. Thank you. I am so glad you shared this row design. I also love to quilt with friends and I would like to make the vertical version for a wall hanging for my sewing room. However, I followed the link to download it and, while the shop notes it is “free”, the checkout persists in adding $5.00 for shipping. No one else charges for a free download. I am so sorry for the mistaken shipping charges. I have updated those settings so it is truly free. Nice row! Thanks for sharing. I know my friends have gotten me through a lot of tough days. That’s a nice tribute! Oh that is just too darn cute! Friends and friendship stars, just darling. Thanks for sharing too! What a great row, and I do like that it can go either way – and that I could make more friends, or however I wanted to do it. Thanks for such a versatile row! The download keeps telling me I have to pay $5 shipping? I updated the pattern page…no shipping fees! I love the friendship star – one of my favorite blocks!! Your row is really cute – and yes, friends are a happy place!! I posted a comment, but do not see it! You have a very nice row! Thanks for sharing! Cute row! My best friends are my quilting friends! Thanks for sharing! Your row is great! So glad you shared it! 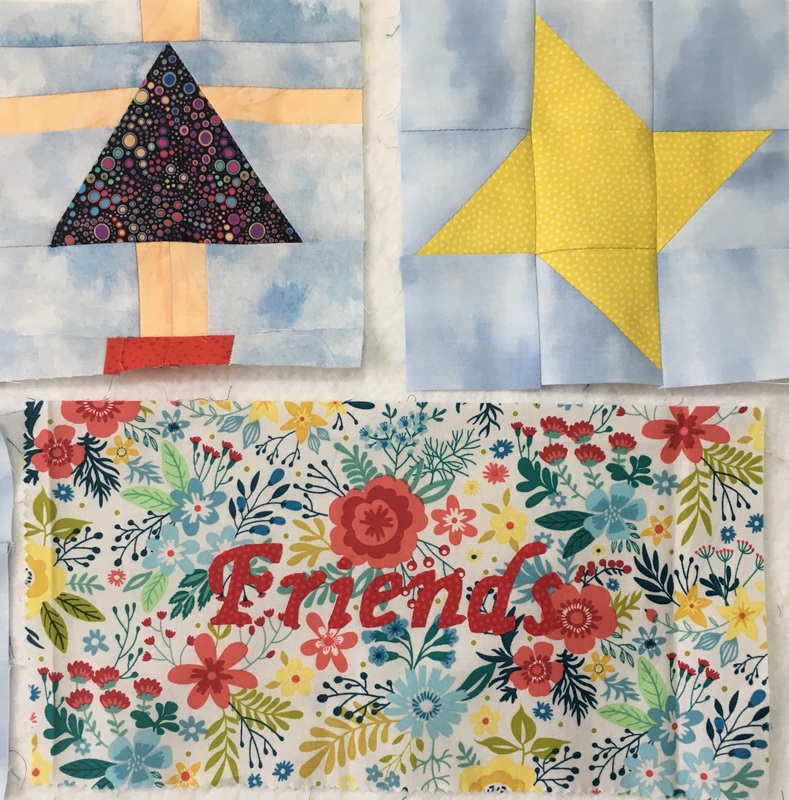 Interesting block – love friendship stars. I like that your row can go either way. Your friendship stars are a perfect choice and your paper dolls are great! Friendship stars have always been a favorite of mine. Thank you for the very cute block. Friends ALWAYS make me happy also, especially the ones that quilt with me. Thank you for sharing your row and pattern. Great days are spent stitching with friends! Thank you for the lovely row you are sharing with us. Thanks for joining us on the Row Along! Thanks for fixing the shipping issue. I love your row – friends are the best! Love your row. Can’t wait to try it. So sweet. Yes, friends are an important part of our happy place. And Quilting friends are the best! Cute quilt! You are right that friends are very important. That’s a very cute block. Spændende at deltage i – tak for din gratis række – håber det bliver et dejligt tæppe, når jeg engang er færdig med at sy det. So cute! I used to love cutting out paper dolls and coloring them, when I was a kid. Thanks for sharing!